In 2019, JR Motorsports welcomes the newest addition to the organization with Las Vegas, Nev. native Noah Gragson. The 20-year old joins the organization fresh off the heels of a strong 2018 NASCAR Camping World Truck Series campaign in which the young driver scored one victory, qualified for the Championship 4 and earned the Most Popular Driver award. Coming off a season like that, expectations will be high for 2019 as Gragson enters his first full-time season in the NASCAR Xfinity Series behind the wheel of the No. 9 JRM Chevrolet with two-time and defending NXS Champion crew chief Dave Elenz atop the pit box. Gragson began his career at just 13 years of age, racing Bandoleros before progressing to the INEX Legends Car Racing Series where he won the 2014 Young Lion Road Course Championship. Following the 2014 campaign, Gragson competed full-time in the NASCAR K&N Pro Series West in 2015 and 2016, earning four wins and the Rookie of the Year honors before moving to the NCWTS full-time in 2017. Overall, Gragson has earned eight NASCAR victories across the NASCAR K&N Pro Series East and West and the NCWTS. In 2017, Gragson’s first full-time season as a NCWTS regular, the Las Vegas native finished 10thin the championship standings and earned an impressive victory at the famed Martinsville Speedway after outdueling two-time champion Matt Crafton on a late-race restart. Gragson followed up his rookie campaign with a dominating victory at Kansas Speedway in May of 2018, career-highs in top-five and top-10 finishes and a berth in the 2018 NCWTS Playoffs, qualifying for the Championship 4. Gragson also made his NXS debut in 2018, making a total of three starts and recording a best finish of second at Richmond Raceway and an average finish of 4.3. 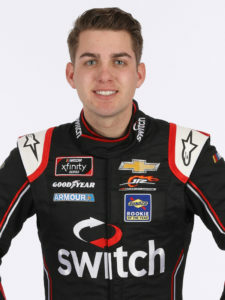 As an alumnus of the 2016 NASCAR Next class, Gragson enters the 2019 season with a championship caliber team behind him as the 20-year old driver begins his pursuit of both the championship and the Rookie of the Year title with a No. 1 JRM Chevrolet that has earned three victories and has qualified for the Playoffs in each of the three seasons the Playoff format has been run in the NXS.